MicroSolar is an approach to solar energy that is geared to the scale of individual and family needs. It is the other end of the spectrum from the growing push to create large scale multi-megawatt solar fields in the desert. It means new ways of meeting traditional needs -- the light, the cookstove, the message. The basic principle is: More with Less. In one sense, it's about that simple. Replacing fossil fuels with solar energy is necessarily a shift from consuming materials to transforming natural flows -- from burning up irreplaceable solids (coal), liquids (oil) and gases (natural gas) to re-learning how to use perpetual water flow (hydroelectric), air flow (wind generators, kiteships) and solar radiation (photovoltaics). It also means creating new artifacts to deliver the services that are built into modern civilization -- getting rid of internal combustion engines (~ 20-30% efficient) by substituting electric motors (~ 90% efficient), eliminating incandescent light bulbs (~ 10% efficient, which at only 65 watts will burn through a barrel of oil equivalent per year of steady operation) by installing solar tubes (delivering natural light into windowless areas) and LED lights (~ 40% efficient). The critically important conceptual shift is to integrate innovations in solar generation ("supply") with innovations in ultra-efficient consumption ("demand"). It is absurd to connect a MicroSolar system to a "Macro" fancy modern refrigerator (which typically consumes at least the equivalent of a barrel of oil per year) -- or an incandescent light bulb. It is equally absurd to use solar energy to produce a liquid fuel to be wasted in an inefficient internal combustion engine in the same profligate way that petroleum has been wasted for a century. MicroSolar principles enable us to embrace altogether new forms of transportation. Our forebears were liberated from designing within the limitations of the horse. (Imagine a parking lot at the Mall, filled with unattended horses and buggies!) Now urban design can be liberated from the limitations of the automobile. As people become more concerned about the environment, they may ask their architect to add a solar energy system to their new building -- to make it more "green". But if the building orientation has already been decided by the layout of the street or the view, or the architect has specified a lot of cute gingerbread for the roofline, it can be quite difficult and costly to integrate solar features. The sun appears in the sky in a well-understood arc which we are not going to change, so our buildings must be oriented to that arc. It's not hard: Windows South (in the northern hemisphere), roof ridge-lines running east-west, and so forth. Furthermore, the heat from solar energy captured by windows in the wintertime -- or shaded from entering windows in the summertime -- is as important as solar panels on the roof. Even though the benefits of MicroSolar are profound, it can be very difficult for people to adapt to new ways of thinking and acting. New methodologies are also needed. One such methodology is very straightforward: youth doing exploratory design science. It is easy to see the consequences of consuming fossil fuels: when the tank is empty, it has to be refilled. But it is hard to see air flowing and you can't use a bucket to quantify solar radiation. Electricity is invisible, so these MicroSolar energy flows require a metering tool, an energy awareness engine. With such tools, a group of students, from Middle School level to University level, can take on the challenge of structuring a Solar Nations Initiative to find appropriate solutions. guide implementation on a large scale. guide implementation on a large scale: marketing and sales on a large scale. MicroSolar principles (more with less) can be applied in all domains of living. In each of these domains, a research project can be established to identify, test and then implement MicroSolar solutions. Please refer to the section on Methodology, above. MicroGrids. Once individual solutions are in place, microgrids can be established in a village or neighborhood. Each microgrid is semi-autonomous and can function independently of larger systems. MiniGrids. Once MicroGrids are in place, they in turn can be linked together into larger scale minigrid units, which in turn can also function independently as necessary. Solar solutions have now become sufficiently sophisticated that the consumer can purchase very small devices, or modular components that can be expanded at will, working within family budgets. In cases where solar devices offset other costs over time, microloans can be created. In the world of electricity, the concept of MicroSolar has not yet been applied on a national scale to serve 100% of a country's population. This elegant use of solar energy is only now truly available, as robust solar systems and reliable components are finally reaching the marketplace. Rather than being seen as "underdeveloped" or handicapped, the rural nation that employs MicroSolar principles will leap ahead of those other countries which are trying to modernize by mimicking industrialized countries with fragile transmission lines and overbuilt, high-energy-consuming appliances. The MicroSolar nation may even leap ahead of those industrialized nations which have become excessively dependent upon complex unstable energy infrastructure. With their unwieldy long supply lines, these industrialized nations are more vulnerable to economic chaos as their access to fossil fuels inevitably goes into decline. For developing countries with large deep rural populations, MicroSolar is a first step towards modernization that does not require centralized power management which inevitably has to deal with transmission line failures that leave everyone on the line stranded without basic services. MicroSolar offers the most resiliency and equity -- if there is a component failure in one household, help is next door where a neighbor's system is still functioning. Basic energy services can be priced within the means of rural people -- first with small affordable devices, and then expanded in a modular, brick-by-brick fashion, to add more solar equipment each year, always within a family's budget. The peak oil community owes a debt of gratitude to King Hubbert, Colin Campbell, Jean Laherrere, Buz Ivanhoe and others in the petroleum industry who brought to light the challenge which humanity faces. And of course it is only logical that they were among the first to ask, "What next?!" It is also logical that when all you know is a geologist's pick, you respond by swinging that pick. The first solution that comes to mind is: find more oil. Trouble with that, of course, is that eventually this algorithm fizzles out, and another has to take its place. Since petroleum industry folks don't necessarily consider themselves to be in the energy business, it is not surprising that most of them would have little knowledge or appreciation for the potential of solar energy solutions. Good point. I guess we will need to hire intermittency engineers. Same as highly distributed. Lots of people (countries) got cheated out of oil, but everybody gets enough sun, even the penguins. As I pointed out before, your car is < 1% efficient, even after 100 years of refinement. Solar panels are 20% efficient and getting better. Sounds like the pot calling the kettle black! Solar can never match the energy density of gasoline. Gasoline is a dangerously flammable liquid. Solar energy is a flux. I can make better devices that run with flux than you can with liquids. There is no comparison. I grant you that oil is pretty magical stuff but using it for energy is like burning the furniture to keep warm on a cold winter night. So we had better keep as much of our oil as possible. In a pinch we can make solids, liquids and gases from sunlight (e.g., for airplanes and rockets). Bottom line, if you are designing an energy-something that has never been built and you aren't a solar engineer, I recommend you hire one. And it might also be time to start asking some questions. Since we use most of our oil for transportation, the first question might be, "How do we engineer a transportation system based 100% on renewable energy (that isn't compound stupid)?" Now at least we have a definition of what we need to do next. If instead of building more energy-efficient cars, we get busy designing and building solar transportation, it might take fifty years, but we won't be wasting our children's inheritance. How can solar power fuel transportation? This is not a pipe dream. 1. Encitra is working with the City of Uppsala in Sweden to design such a system based on a presentation "How Can We Turn Sun Radiation into Automotion?" (pdf) at "The Future of Automotive Energy: Fossil Fuels, Agro Fuels or Photovoltaic Cells," hosted by The Swedish Institute for Transportation and Communications Analysis (SIKA) and Center for Sustainable Development (CHU) at the Royal Institute of Technology on November 6, 2007. In that presentation it was demonstrated that solar powered podcars may be able to perform across the board 5 to 10 times better than the automobile: more than 10X lower operating costs, much more than 10X safer, 10X more efficient, 10X fewer emissions, 10X less land use, 10X less materials, etc. Which countries will capitalize on this advantage? Certainly not a country which puts all of its dwindling natural resources into "improvements." It's too late for incremental change. We need a breakthrough. 2. Swenson Solar has just completed a 600 kW solar project in Santa Cruz where a canopy has been constructed just about like the one in the illustration above. Solar transportation will happen. The only question is whether the USA will get on board soon enough to become a leader (exporter) rather than a follower (importer). Congress might like to see the USA become a leader in developing new export opportunities. Will the USA lead or follow those already under way in the UK, Sweden, and the UAE, plus projects under consideration in China, India, etc.? We have to shift our point of view. We have to automate with computer robotics something that is erroneously called an "automobile." We must take the "automobile" off the ground where it has imposed mortal danger to humans and animals for a century. Protecting the world's dwindling sources of oil has also put our youth in harm's way. That would be reason enough to change our point of view. After all, the automobile wasn't fashioned after a horse. The answer is to get off fuels altogether. Use the flux of the sun and convert it to electricity. Do President Obama and Congress actually want to get the USA off foreign oil? They need to know that flex fuels won't even get us close. Neither unfortunately will the electric car. It just isn't efficient enough. Solar podcars will use electricity as it is being generated (most traffic is during daylight hours) whereas the EV fleet will need mountains of batteries to be charged mostly at night, completely out of phase with travel time. Congress needs to know that there is a solution that can be made right here in the USA, and won't require any fuel supply. Fuel -- any of that liquid stuff which goes into a vehicle's tank only to deliver a net efficiency of less than 1% -- in 2011 is as out of date as hay was becoming in 1911. We will be able to build 5-10 miles -- including a permanent power supply -- for the budget in every mile of new high speed rail, and we don't have to worry about property acquisition or safety at grade crossings. We will use only the air rights over existing rights of way. Upgrade Amtrak to bi-directional passenger rails for far less and use the balance of the $500 billion envisioned to replace oil-based routine travel with solar. What percentage of our energy demand can be replaced by renewables? I hear the question, "What percentage of our energy demand can be replaced by renewables?" There are two unquestioned assumptions that frame this question and illuminate our fossil-fuel mindset. 1. One good answer is none. "Replacement" suggests doing things the same way. 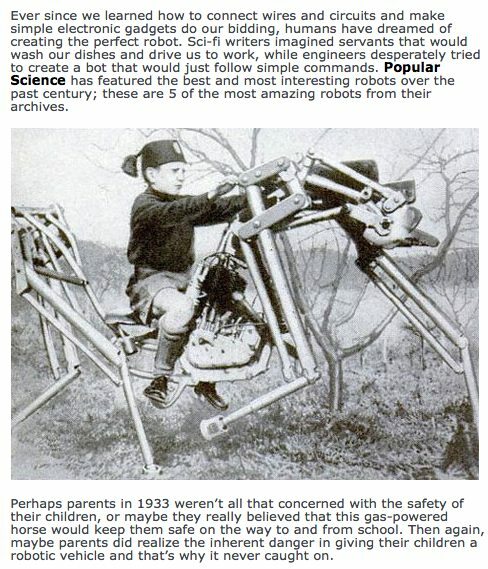 We can't "replace" oil with sunshine any more than we were able to "replace" horses with high-speed 4-legged robots shaped like horses. We jettisoned horses and made devices with engines and wheels. Now we must jettison devices with engines and wheels that are 1% efficient, that weigh 2 tonnes to move 100 kg. Now put that <<1% efficient biodiesel (stupid) into a car that is <1% efficient (stupid) and you get << 0.01% efficient. The result? Compound stupid." 2. Another good answer is 100%. Built into the question (remember the question, "percentage of energy ... replaced by renewables") is the curious assumption that we have a choice. We don't. Most of humanity lived within a solar budget until World War II. As near as I can tell, we have no option but to return to 100% renewables, whatever that may look like. (I'm all ears if you think you have found something else.) With the incredible amount of knowledge and skills we have gained during the fossil fuel era, we are much more capable than our grandparents to take on the task. If we are to avoid becoming a dead branch on the evolutionary tree, we will switch to renewables now so we can leave something for our children to work with. It's not "practical." We will face skepticism and ridicule. But those who embrace renewables now will be the sellers in the post-oil economy, and there will be plenty of buyers who postponed the inevitable shift.